Leonard Nimoy was an American actor, film director, poet, musician and photographer. Nimoy began his career in his early twenties, teaching acting classes in Hollywood and making minor film and television appearances through the 1950s, as well as playing the title role in Kid Monk Baroni. In 1965, he made his first appearance in the rejected Star Trek pilot, “The Cage”, and would go on to play the character of Mr. Spock until 1969, followed by seven further feature films and a number of guest slots in various sequels. His character of Spock generated a significant cultural impact and three Emmy Award nominations; TV Guide named Spock one of the 50 greatest TV characters. During this time, Nimoy also won acclaim for a series of stage roles. He appeared in such plays as Vincent, Fiddler on the Roof, The Man in the Glass Booth, Oliver!, Six Rms Riv Vu, Full Circle, Camelot, One Flew Over the Cuckoo’s Nest, The King and I, Caligula, The Four Poster, Twelfth Night, Sherlock Holmes, Equus and My Fair Lady. 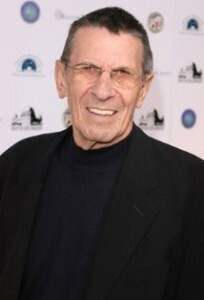 Leonard Nimoy also released five albums of vocal recordings on Dot Records, including Trek-related songs such as “Highly Illogical”, and cover versions of popular tunes, such as “Proud Mary”. Later on he played Dr. David Kibner in Invasion of the Body Snatchers, as Dr. Jekyll and Mr. Hyde in The Pagemaster and as Mustapha Mond in Aldous Huxley’s Brave New World.. He also did occasional work as a voice actor in animated feature films, including the character of Galvatron in The Transformers: The Movie in 1986. Together with John De Lancie, Leonard Nimoy created audio dramatizations of: The Time Machine, A Journey to the Center of the Earth, The Lost World, The Invisible Man, and The First Men in the Moon. Among other audio productions where he intervened in the narration of the English version of the Sega Dreamcast game Seaman, the promotion of Y2K educational films, and a series of voiceovers for the computer game Civilization IV. He was also known for the TV series Next Wave where he interviewed people about technology and for being the host of the documentary film The Once and Future Griffith Observatory, running in the Leonard Nimoy Event Horizon Theater. Leonard Nimoy passed away on February 27, 2015, at the age of 83, in his Bel Air home.